Lipstick Shades: What Color Should You Wear? For years I would stand before the makeup counters at department stores and stare befuddled at the lipsticks. To me they looked like the entire U.S. Marine Corps standing at attention — they were all so darn cute, how was I to pick the perfect lipstick shade for me? Turns out picking the right shade of lipsticks or lip gloss isn't so complicated, after all. Of course it would take me 15 years of buying the wrong shades of lip color to find this out. The most flattering lip tones will be one or two shades darker than your natural lip color, according to makeup artist Bobbi Brown. "If I had to teach someone just one thing about lip color it would be this: Find a lipstick that looks good on your face when you are wearing absolutely no makeup," Brown wrote in her book, "Bobbi Brown Beauty." To test shades, apply lipstick or gloss to one lip. If that color is just a shade or two deeper than your bare lip, then you've found your shade. Yes, it's a simple as that. So what to do if you like to buy your lipsticks at a grocery store or department store, where you can't try the lipsticks out before you buy? You can trust the color printed on the box. Simply hold it up to your lips in the store and check it out in the mirror. Or better yet, check the color out in a window, where natural light shines through. I always recommend trying before you buy. So if you pick a color from a drugstore, choose one that has a liberal return policy, like Rite Aid. If your lips are on the thinner side, stick to light-to-medium shades of lip color. Dark shades will only show off those thin lips. Creamy lipsticks and tinted glosses are also a good bet, the creaminess and gloss adds plumpness. Many women wrongly believe they can't wear red lipstick. Red lipstick is timeless and bridges age and culture. The secret to choosing the right red lip color is in the undertones. Pink-skinned girls should opt for cherry red. Those with olive skin can wear fire-engine red. Dark skin looks great with deep reds. One big red lipstick no-no: It's best not to match lips to your outfit. Don't want to go all out with red lipstick? Create a red lip stain with a little trick I got from InStyle Magazine. Makeup artist Angela Levin smoothes on Dr. Hauschka lip balm, which acts as a lip primer, then applies red lipstick over it with her finger. The result is a gorgeous sheen of red. Don't throw out those lipsticks that are just a wee bit off. You can create a great lip color by blending lipsticks you don't like. For lipstick that's just a bit too bright, tone down the color with a darker liner before applying a lipstick. Use a lip brush when applying strong colors. You need a mirror and expert application so you don't paint the outside edges of your mouth. While you can line lips before or after lipstick or gloss application, I find lips look more natural when I line lips after I apply lipstick. To keep lipstick from wearing off so fast, fill in lips with liner before applying lipstick. This acts as a color base, so when the lipstick wears off you still have color. While picking the right shade is as easy as going a couple shades darker than your natural lip color, we can delve just a wee bit deeper in the science of shades and skin tone. 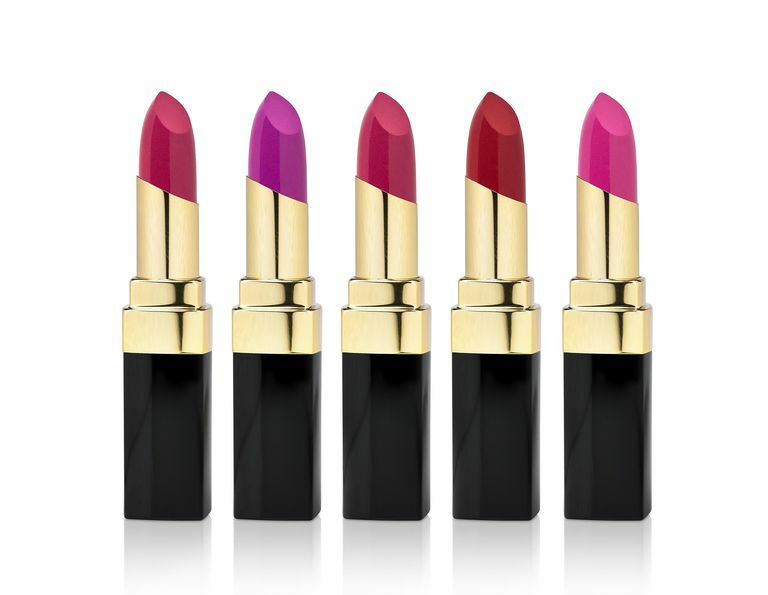 Women with fair skin, look great in lipstick shades such as nudes in a slightly apricot shade, pinks and light corals. Stay away from browns, which will appear blah. Those with a medium skin tone can go a bit darker. You'll look great in roses, mauves and berries. Skip the bright reds and consider a deep burgundy instead. Deep plum, chocolate or red is fabulous with dark or black skin. According to the editors of Allure's "Confessions of a Beauty Editor," women with dark skin "can go in one of two directions: toward brown or purple. Think caramel or walnut for day, and plum or wine for evening."